I cannot take credit for finding this grave other than coming across it when searching his name on the internet, in fact I do not believe I have ever been to Kilsyth Cemetery so someone else found it for me. However I do not believe the person who added it to 'find a grave' knew it was the grave of a former footballer. 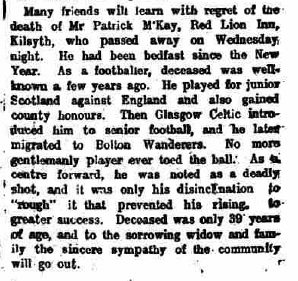 Patrick McKay was a deadly Centre-Forward for Kilsyth Emmet, in time earning him a Scottish Junior cap v England in Birmingham, this was good enough to raise the interest of Celtic, and not long after his international appearance he was given an opportunity to play for the Bhoys in the Glasgow League. He scored both of the goals his debut, Celtic's 2-2 draw with Third Lanark at Cathkin Park. That brace probably earned him a contract, but earning a contract does not mean an automatic place in the first team. So by October he was transferred to Bolton Wanderers, where it seems he rapidly dissapeared into the reserves: by the end of the 1898/99 season the Kirkintilloch Herald repord he had been re-instated as an amateur, and was playing again with the Emmet. Over the next season and a bit I have found him playing with Clydebank, Falkirk and Aberdeen before finally signing full-time with Bo'ness. 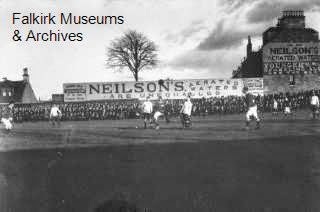 Another pic from the past, [there are lots of them out there if you are willing to dig] this one [according to the caption] is from the Falkirk v Aberdeen Division 1 Match at Brockville Pk on the 14th of March 1914: 2-0 to Falkirk, and the houses in the background certainly appear to be those in Watson Street. I am somewhat perturbed by this picture. 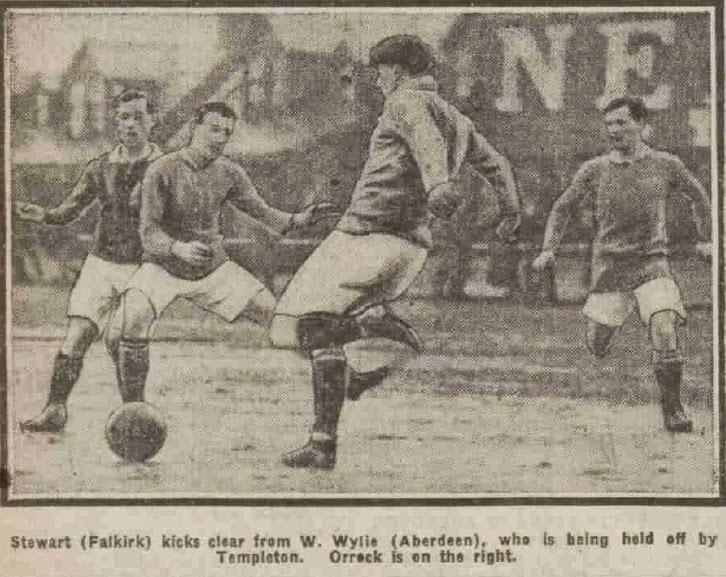 The two players named as Falkirk players seem to be wearing a lighter coloured top than the Aberdeen player; I do not know what the Aberdeen change strip was this season, but at this point Aberdeen wore Black & Gold stripes so it is definitely not that; to my knowledge there has never been a Falkirk player by the name of Templeton; to the right the player may or may not be Robert Orrock [I'm not sure though]; the player named as Wylie looks awfy like Thomas Glancy of Falkirk to me. That and the fact there is no way to be 100% sure that the goalie is Alex Stewart, makes me think something has gone wrong up Dundee Courier way. I'm also interested in what that advert might be "NE..." could be anything. I ought to have looked at the Falkirk Council site too, but I always look for the obscure. On reading more Neilson's had the privilege of creating that horrid drink "Coca-Cola" for you people in Falkirk, until the massive giant that was Barr's swallowed them up. Based in the Pleasance, I have today also noted a junior team by the name Rosehall Swifts, who may, or may not, have been their works team ..... so much to explore .... every answer brings me more questions!!!! !